Disclosure: This is a sponsored post for SheSpeaks/Walmart. All views are mine and mine alone. When you stock up to get everyday essentials for less, you won’t run out when you need something most. The April Stock Up & Save Event is in full swing right now, with top brands like Tide, Bounty, Pampers, Venus, Gillette, and more all on sale and ready for you to stock up and save! I was getting concerned that Mother Nature didn't know it was spring here in New England, when we got hit with 5 inches of snow a couple weeks ago. After a week of temps in the high 50's I was all ready for spring, and had the windows open to air out the stale winter air in our home. I was also building up for my annual spring cleaning of the house, which always includes a visit to Walmart to stock up on spring cleaning essentials. I can always count on Walmart for offering everyday essentials for less. And, when the price is right I will stock up and add to my growing stockpile in the basement, as not to run out of things like paper towels, toilet paper, shampoo and conditioner. With two little ones 5 and under, the last thing I want to do is load them into the car and take them shopping. usually a trip to the store turns into an all-day venture, where I usually return with items not only my shopping list and missing the most important essentials I went to the store for in the first place. The girls see a store and instantly think new toys. I think, "how can I navigate the store and grab what I really need, without going near the toy section and getting out in record time." :-) But, my thought process never works. So, when it comes to stocking up on things like spring time essentials which are usually bulky and take up shopping cart space already used by two little ones, I shop at home in my pj's and slippers and wait for my order to arrive at my door. :-) I am so thankful for online shopping at Walmart and their special annual events like their April stock up and Save one, as I get to stock up on my everyday essentials and those needed for my spring cleaning and not have to worry or stress about a visit to the store with my girls. Last week I took advantage of the April Stock Up and Save event at Walmart. Prior to ordering online I took inventory of my current stockpile to see what I could replenish and then checked under the kitchen sink to see what cleaning products I needed for spring cleaning. Then, while the girls were sleeping at night, I logged on and in under 10 minutes I had my order placed and paid for. I didn't have to battle check out lines, fussy and inpatient little ones and got everything on my shopping list. It was great. And, then a few days later, my Walmart box arrived at my door. I don't think it could get more convenient than that. 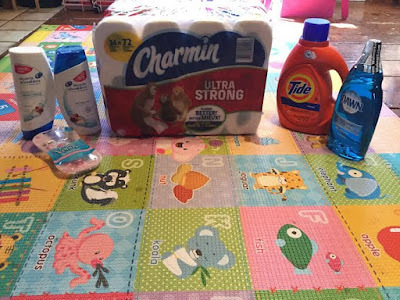 Not only was I able to shop with ease for everyday essentials, but I saved a ton thanks to Walmart's Stock Up and Save event. In addition, I used my Ibotto Rewards app on my phone to submit my receipt and save even more. :-) So, it was a win-win! If saving at Walmart with their low prices wasn't enough, make sure you add the Ibotta Rewards app to your phone so you can save even more. Start saving (beginning April 11th) by logging in to the Ibotta app and checking out rewards from P&G. And, now that the snow from the fluke snow storm we had 2 weeks ago is gone, I am ready to tackle my spring cleaning. Just last week I donated 16 boxes of toys and clothing to Goodwill. It felt good to donate, but I am more happy to see extra empty space around the house. Once the house is ready for spring/summer I will be looking at Walmart to stock up on summer essentials so that my family can enjoy time outdoors, making memories, enjoying the warm temperatures and spending time with family and friends. I can always count on Walmart to offer products my family needs for any and all occasions, while also saving me $$$. Not only will it feel good to have a cleaner house, hopefully a little less cluttered, but you will smile when you see how much you save by purchasing some (or all) of of the above Stock Up and Save participating products. Remember there is added value — and savings — in stocking up. So, what are you waiting for? Let P&G and Walmart help you save today! And, don't forget to reward yourself with Ibotta rewards when you stock up. 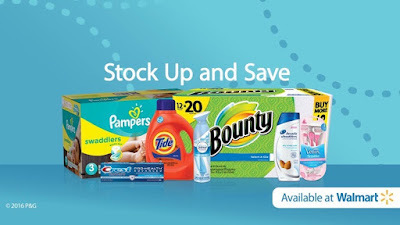 Right now you will find rewards from P&G with the Ibotta app for extra savings during the Stock Up and Save event at Walmart. FYI...If you’re afraid of missing out on this event, you can “attend” the April Stock Up & Save Event on Facebook to learn more information and get reminders throughout the month. Thanks for sharing this information that reminds me we are out of Tide and this is a great time to stock up. These are definitely some of my favorite products! We love Bounty select a size paper towels!